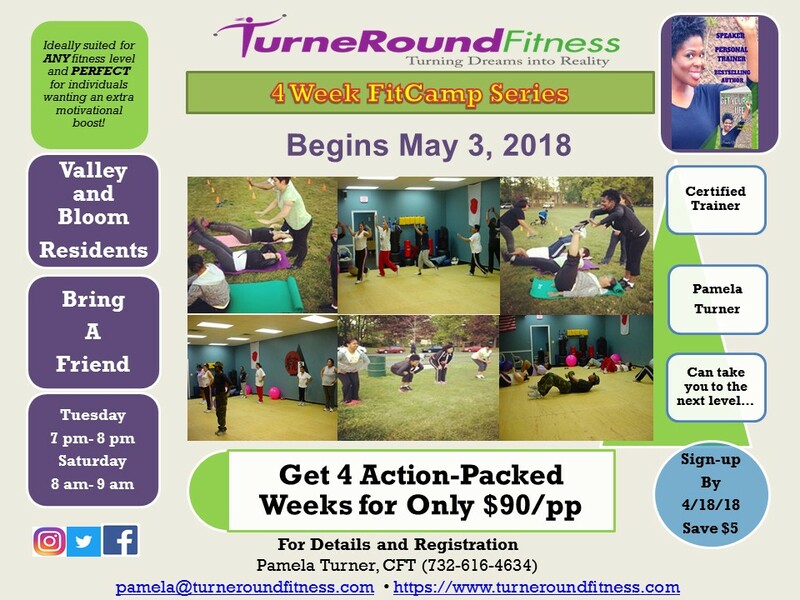 TurneRound Fitness - FitCamp, Get In Shape & Have Some Fun! *all classes are non-refundable and there will be a 4% paypal service fee applied to each transaction. Improve upper and lower body strength, cardiovascular endurance, flexibility, agility, and mental focus. FitCamp is a program designed for all fitness levels. This class is suitable for beginners through experienced athletes, mature adolescents through seniors, who are in good health. It is efficient because you work your entire body –heart and muscles—by going from one exercise to another with minimal to no rest in between. The workout involves calisthenics like push-ups, jumping jacks, crunches and other body weight exercises…the difference is in the intensity. Your challenge is to take your body to its limits. You work, You have fun, You Sweat, and best of all You burn a lot of calories. Absolutely NOT! This program is specifically designed to meet the needs of inactive and active adults. The scope of the program is aimed at getting you in shape by exposing you to a comprehensive fitness program. We (Pamela and James) are here to motivate and encourage you to do your best and to push yourself to the next level. You will need a water bottle (1liter), exercise mat, good running shoes and a desire to succeed. If you are looking to make improvements in your overall physical appearance and well-being, this is for you! You will feel more energized and look and feel more confident, plus you will be meeting people like yourself and there is POWER IN UNITY. "Performance Improvement" can take place in as little as three days. "Visual Improvement" can take from two to four weeks depending on your effort level. It is common to see as much as 3-8 pounds of weight loss with diet adjustment. Remember, everyone is different, what you put in it determines what you will get out of it! What will I do after camp? Continue some type of Cardio (running, walking, biking, jump rope, etc.) and strength training (utilizing resistance bands, dumbbells) for at least 3 times a week. What if I want to take it to the next level? TurneRound Fitness, LLC also offers one-on-one personal training for those individuals who wish to go further. There are currently no event listings at the moment. However, please check back with us soon.